Prada Infusion D'Iris is an elegant perfume that is sure to accent your natural fragrance. 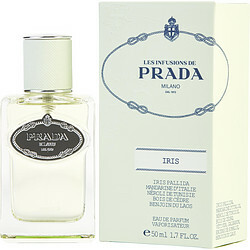 Prada introduced this elegant perfume for women in 2007. With notes of mandarin, cedar, iris, benzoin, and orange, this scent is subtle and mature, making it ideal for many casual occasions. The scent is sure to appeal to those around you, and it won't overwhelm your senses with strong or obtrusive notes. Simply spritz the scent on and enjoy the long-lasting scent. Love this scent, curious why the price has increased so much??? Too popular now??? One sentence. I’m in love with Prada/Iris. I stumbled upon it and immediately got married to it. I love this fragrant. Ever since my son gifted me a bottle of this , I have been using it ever since. This is for Prada Infusion D'Iris. I hope you continue to carry this. Married to This fragrance ever since I came Out. Clean, and different. It is I! Everyone compliments it!